As much as I love good, wholesome sushi, it pains me to have to constantly extend my overdraft whenever I start to crave some. Sure, like anything else in life, high quality comes with a high cost, but sometimes, I just want to strike a balance. Sometimes, I just want to enjoy some good, simple sushi without having to remortgage my home. 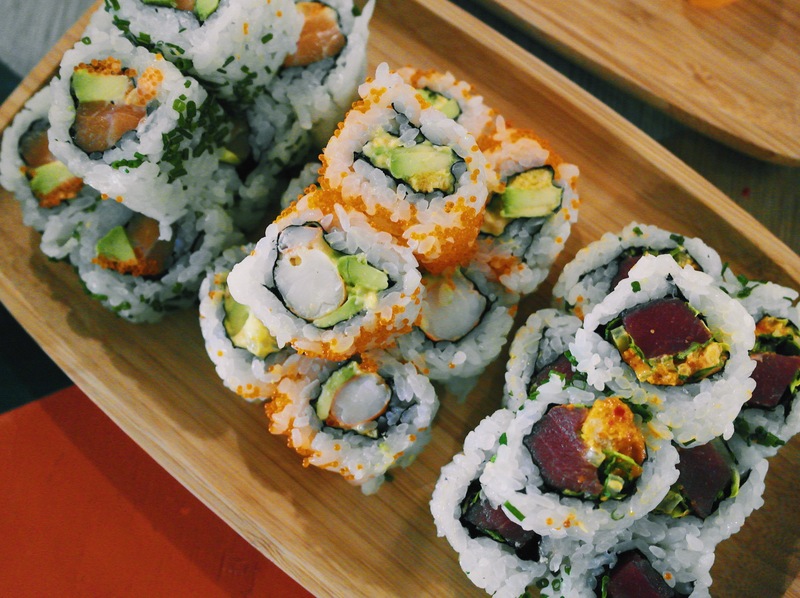 My desperate search for affordable maki led me to Yoobi – a casual eatery in Soho that dares to infuse vibrant Brazilian influences into everyone’s favourite Japanese staple. With my interest piqued, I headed over for a meal that my accountant would (hopefully) not assassinate me for. Principally, Yoobi serves up temaki rolls – large cone-shaped rolls that are suitable for sharing or running out of the door with. However, they also offer maki roll versions of all of their temaki formulations, alongside a limited range of sashimi and nigiri. To begin, we ordered a helping of salmon nigiri. The soft, succulent salmon possessed a relatively rich and buttery flavour, and unified well with the bed of soft, sticky rice. We also ordered a plate of spicy tuna maki rolls, which, despite the name, were not really spicy at all. Despite this, the thick, meaty tuna did well to provide a satisfying texture. Meanwhile, the citrus salmon rolls – one of the “Brazilian-inspired” formulations, offered a very subtle zest, which worked well with the flavoursome salmon, but, could have packed a bit more a “citrus kick”. Texturally, the tiger king prawn maki won our favourite spot, as the pieces of soft and thick prawn were satisfyingly contrasted by the firm crunch of the croutons within the rolls. Generally, temaki rolls cost about £3-£4, whilst maki roll versions range from £5 to £9. Our own bill amounted to approximately £32 for for two, which we felt was reasonable for a filling sushi meal in the centre of London. Sure, the quality of sushi is undoubtedly superior at some of the high-end establishments that can be found nearby, but you can also expect to pay double or triple the price. Where Yoobi does fall short however, is in its service. Getting menus, ordering, and paying the bill all proved to be excruciating processes, owing to a general lack of speed and attentiveness of certain members of staff, who, in fairness, seemed to be a little less experienced than their colleagues. Staff members were otherwise perfectly polite and friendly, and thankfully, we weren’t waiting too long for our food once we actually got round to placing an order. The restaurant itself is airy and spacious despite its small size, and the casual, care-free decor helps to create a comfortable and laid-back environment. Yoobi can be found a 10-minute walk away from either Tottenham Court Road, or Piccadilly Circus stations. Whilst there are numerous high flying establishments across London that offer phenomenal sushi at equally “phenomenal” prices, there are very few that offer “good” sushi at reasonably “good” prices. Yoobi, is certainly one of them. It certainly won’t blow your mind, but if you’re really just craving some simple sushi in a simple setting, without any of the frivolity or the expenditure, it would definitely be worth a try. Halal status: The menu is comprised solely of seafood and vegetarian dishes. Alcohol is served on the premises.